As a confirmed sampler of MOOCs I’ve had plenty opportunity to roam around the enormous clunky forums that characterise xMOOCs. I try to make sensible contributions to the argument of the day but participant behaviour and interaction can be a compelling distraction. Some things are clear. Commenting on xMOOC forums nowhere plumbs the sickening depths of some comments elsewhere (eg YouTube). Also, real out-and-out trolls are rare. All the same, I think that something is rotten in the state of Denmark. What will cause a comment to give offence and what level of offence is caused can be difficult to judge. In my young days using the F word was clearly offensive in polite company and even now I can’t help feeling a bit offended when it’s used needlessly on the web. (It’s even in the title of a popular science website for godsake!) These days and depending on the circumstances, such usage might be considered only mildly offensive by many participants in a forum but it stands to reason that, among a large population of users, some could be very offended indeed. So care should be taken writing comments addressed to diverse international audiences although second-guessing exactly what’s offensive can be extremely difficult or even futile. For example, my use of ‘godsake’ above does not offend me at all but could offend some on religious grounds so I might be reluctant to use the word in a public forum – sound thinking or over-thinking? Also, if you were Danish and not too familiar with English quotations, might you be offended about the rotten state of Denmark above? I really don’t know but it’s possible! MOOC forums usually have some degree of moderation so that really crass comments are swiftly removed but there are other less obvious circumstances where forum participants themselves can help set the tone. On one occasion I was appalled that a perfectly sensible comment by a lady tentatively posting for the first time, was considered “stupid” by someone else (OK, a man). The forum was huge and his was the only other contribution in the thread. Throwing caution to the winds, I commented that his comment lacked substance (it did) and then made a brief comment on the topic of the thread myself. Someone down-voted my comment (slight offence taken! I’ve mixed feelings about the use of down-vote buttons.) There was no response from the original poster until a host of comments began to arrive (all from women), including some really good substantive contributions. Although nobody mentioned the original male put-down, solidarity with the original poster was very evident. Finally, she actually thanked me for intervening. She’d genuinely feared that her comment was somehow inappropriate. Such apprehension by forum newcomers is not uncommon. Newbie posters who are not offered support when it matters may never return to the forum again. I once had an argument in an xMOOC forum with someone who held that a MOOC forum should not to be regarded as a support group. I disagreed. He was a champion of robust no-holds-barred debate and had a good grasp of most topics under discussion, contributing real expertise, useful links and references etc. But he could be pretty bombastic and nit-picking and sometimes just plain insulting to those brave enough to comment on his posts. This led to some very heated arguments but if you can’t stand the heat should you not stay out of the kitchen? Lively robust debate does have its attractions, if only as a spectator sport and it’s understandable that moderators are reluctant to intervene until clearly unacceptable levels of confrontation are reached (see Godwin’s rule of Nazi analogies!). On the other hand, in a large forum, there are usually participants with the necessary topic expertise and sufficient empathy to respond constructively to a badly expressed question or a mistaken assumption in a way that aids understanding, positively advancing discussion without any suspicion of a put-down. Can some way not be found to encourage those who revel in confrontation to conduct their ding-dong battles elsewhere, perhaps in well-advertised threads or sub-forums, so that safer spaces are left for the vast middle ground of learners who appreciate less competitive and more supportive environments? A great advantage of online asynchronous discussion over face-to-face is that there is a golden opportunity for considered thought and reflection before responding. No matter how irritating the indiscretions and errors rightly or wrongly perceived in the comments of others, there’s usually time to allow tolerance and understanding to break through. Commenting with caution and sensitivity to context is always a safe alternative to knee-jerk reactions made in the heat of the moment. Can opinions be freely expressed in a supportive environment without giving offence to anyone anywhere? At one extreme, robust debate can degenerate into aggressive personal attacks while at the other, excessive concern about giving or taking offence can stifle discussion, particularly if confronted with closed minds and fixed ideas. More empathetic moderation and a re-think of how xMOOC forums are structured is in order but forum participants themselves should have at least some responsibility for everyone’s learning as well as their own. A thick skin should not be necessary in a forum but a paper-thin one and extreme readiness to give and take offence, is unlikely to further anyone’s learning objectives. We must all learn to tolerate minor perceived offences …. hmm… . so now I’m off to visit that popular science website but without naming it here! 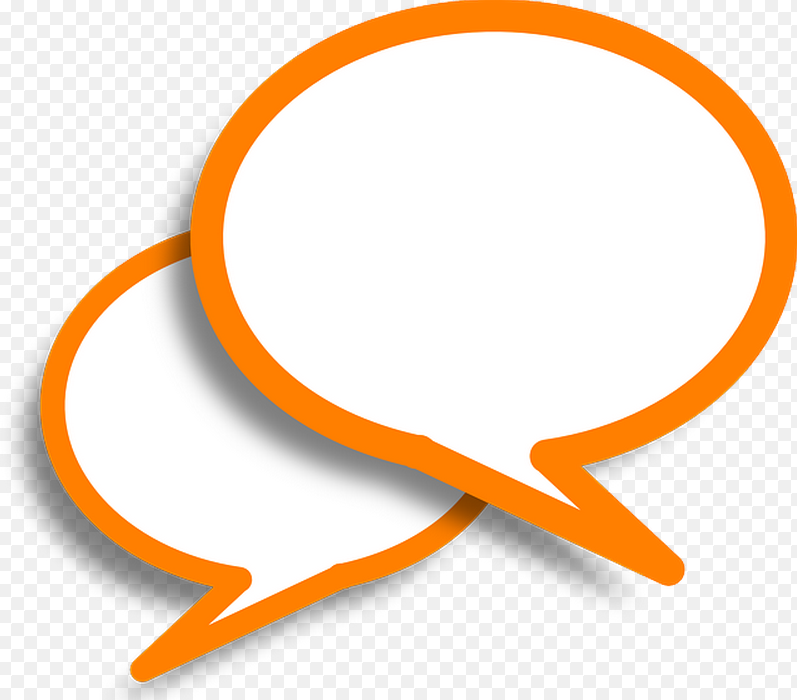 I originally developed the Comment Collector as a ‘scraper’ program for scanning the RSS feeds of blogs in connectivist MOOCs in order to generate brief summarised versions of participant posts and their comments. The idea was to provide quick and constantly updated impressions of current MOOC activity (see ‘Pages’ menu above for details). I ran the Comment Collector twice daily for periods during several MOOCs with encouragement from participants and facilitators. 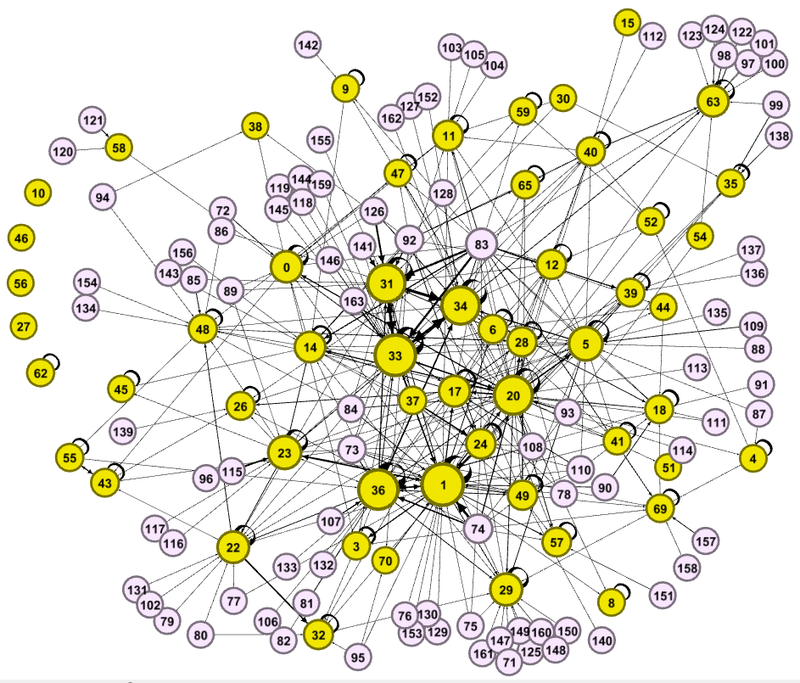 The Collector amasses a considerable amount of data during the course of a MOOC and this raises possibilities for visualisation of the network formed by connections between the authors of blog posts and those who comment on them. Twitter networks have been visualised in a variety of forms, notably by Aras Bozkurt and Martin Hawksey and with some modification the networks formed by blogs and their commenters can be visualised in similar ways. I have written a Python program for experimenting with blog and comment visualisation. The data generated by the Comment Collector is used to produce formatted output for display using the excellent Gephi network visualisation and exploration software . The example below illustrates visualisation of a network created by posts and comments from 70 WordPress and Blogger blogs based on an OPML file kindly supplied by Laura Gibbs . This visualisation corresponds to the last 10 days of the Rhizomatic Learning course (Rhizo15). Names and Numbers – The real names of all blog post authors and commenters have been replaced by numerical labels – blog authors from 0 to 70, others from 71. Nodes and connections – each node represents either a blog (yellow) with at least one post published in the time interval, or a commenter (pink or yellow). A black line connecting a commenter to a blog represents comments made by the commenter on that blog. The more comments, the thicker is the connecting line and the arrow head pointing at the blog’s node. A loop to and from the same blog node indicates comments by a blog author on their own blog. Node Size – The size of a node is proportional to the number of connections made by the node – ie the total number of comments to or from the node. Examples – Commenter 88 (top right) comments on blog 31. The thick connecting line and arrow head indicates several comments (actually 5). Commenters 5, 11, 82 and 83 comment on blog 48 (left hand side). The thin lines indicate a small number of comments (actually 1 each). Although 11 denotes a blog (< 71), the node is coloured pink as no posts were made by 11 during the time interval. The absence of a loop on 48 indicates no comments made by the blog author on his or her own blog. The cluster around blog 40 (bottom left) represent blogs that have posted during the time interval but have not made or received comments. Their nodes appear yellow with no connections. Scope – Data was collected only from WordPress and Blogger blogs with posts carrying the rhizo15 hashtag. These two popular platforms account for the majority of blogs but several other forms of social media (Twitter, Google plus, Facebook etc) were also used in Rhizo15 and are common in connectivist networks. Names of Participants – Accurate visualisation depends on accurate identification of names, particularly the names of commenters. If Fred Blogs is a blog author his blog’s RSS feed will probably output his name consistently as, ‘Fred Blogs’ but Fred is more likely to be inconsistent when commenting on other blogs, perhaps as ‘fred blogs’ or ‘FredBlogs’. This can be dealt with by eliminating white space and upper case so that all names reduce to the form, ‘fredblogs’ but resolving ambiguities resulting from ‘Fred_Blogs’, ‘fred B’ or just ‘Fred’ is not straightforward. If there is no ambiguity a look-up table can map ‘Fred’ or Fred’s other known aliases to ‘fredblogs’ but in general, the inconsistent use of names by commenters is a problem with no easy solution. Lost Comments – The Comment Collector normally downloaded RSS feeds every 12 hours but, very occasionally, a post attracting a large numbers of comments immediately after a collection resulted in some new comments being replaced in the feed by later comments before the next collection time. Checking the accuracy of blog postings and comments with the original posts (rather than the RSS feeds) is a lengthy and time-consuming task. It has not been done rigorously! Less detailed but more comprehensive visualisations can be obtained by aggregating data over longer time intervals. The visualisation below (same format as above) corresponds to the last 5 weeks of Rhizo15. It involves posts from 49 blogs and 148 blog authors and commenters. The concentration of the most active bloggers and commenters in the central part of the network and the extent of their connections with each other and with the wider network is very evident. 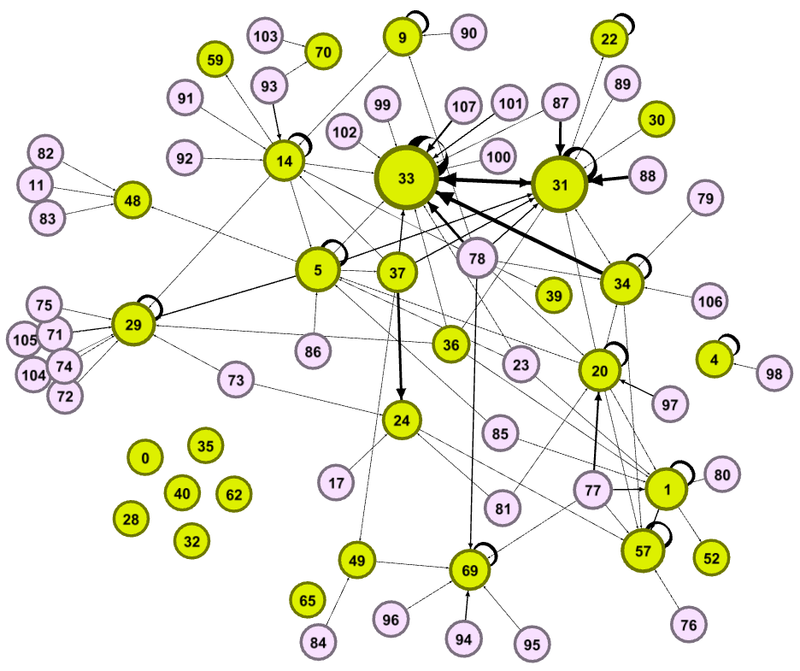 Less connected blogs are located on the periphery and several connect with different clusters of commenters who have no other connections. The four disconnected nodes on the left represent blogs with new posts but without outgoing or incoming comments during the time interval. My interest in the visualisation of connectivist networks has mainly been in the programming and the creation of objective data that could throw some light on how such networks form and develop. The visualisations above are examples of what might be achieved but are not definitive in any way. 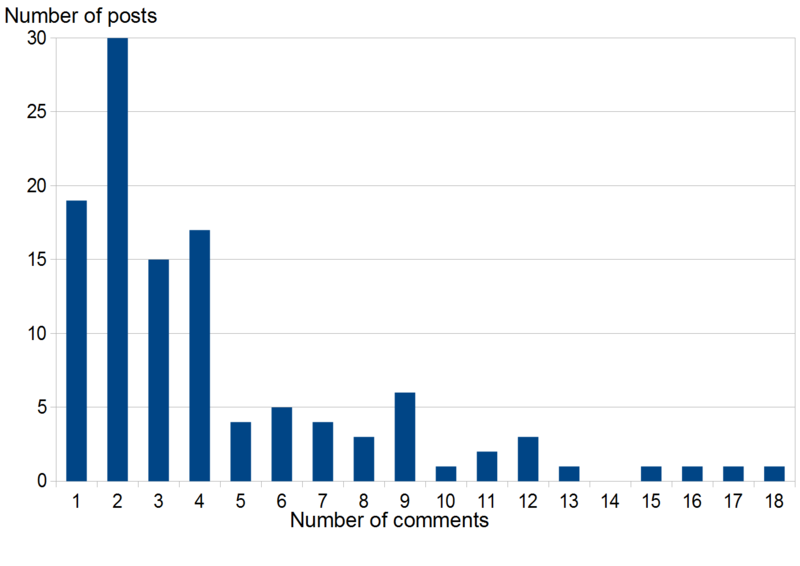 Features such as the number of connections per blog or the the number of comments connecting a commenter to the same blog could be visualised differently, or maybe not at all in favour of other more meaningful measures. How visualisations should be presented and interpreted depends on many factors and I’ve only begun to look at Social Network Analysis. I did try a modularity program available in Gephi that attempts to separate the nodes of a network into distinct communities – with little success suggesting that Rhizo15 is a good example of a well-distributed connectivist network! There are certainly dangers of jumping to highly subjective or even judgemental conclusions when it comes to interpreting blog and comment visualisation. 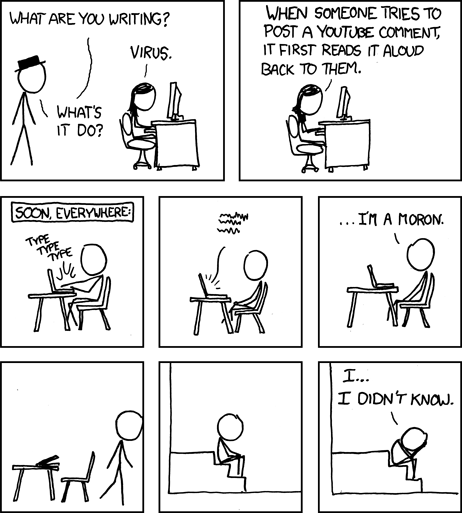 For example, bloggers who are unresponsive to comments on their own posts are not necessarily being inconsiderate. Receiving no comments on a post is not necessarily a reflection on its quality or content. There are also wider issues concerning privacy. Although the underlying data is publicly available, detailed revelations about the posting and commenting habits of MOOC participants could be considered inappropriate and tantamount to snooping. This is one reason why participants’ names in the rhizo15 visualisations were anonymised (although I’ll supply any interested participants with their own number on request). Are blog and comment visualisations useful? There are definite possibilities for research in conjunction with visualisation software such as Gephi. If privacy concerns are properly addressed then visualisation might also have a part to play during a MOOC but exactly how and in what form is an open question – comments and suggestions are welcome! I recently joined ‘Fantasy and Science Fiction: The Human Mind, Our Modern World‘ by Prof. Eric Rabkin of the University of Michigan. This is a typical Coursera xMOOC with the usual closed forum populated by a minority of participants. I never spotted Prof. R. in the forums but there are a number of helpful TAs, some having completed the course on a previous iteration. Videos are presented in ‘flipped’ format. Prof. R. releases a brief ‘Before You Read’ video, setting the scene for each weekly topic (eg ‘Lewis Carroll’) and then there’s assigned readings and a 270 to 320 words essay to write, “on any literary matter that you studied in that reading: plot, style, theme, structure, imagery, allusion, narrator reliability, and so on.” The essay, “…should aim to enrich the reading of a fellow student who is both intelligent and attentive to the readings and to the course.” So far so good but the essays are peer reviewed and the system software only allows essay writers to see their own reviews after they review 4 or 5 other essays. A small minority of reviewers submit a minimum of desultory remarks, or even random nonsense, just to comply! Several videos by Prof. R. discussing different aspects of the topic, (eg 8 videos for Lewis Carroll), are released following the peer assessments. Prof. R. has a very relaxed style of delivery and I found the videos really enjoyable and informative. Writing the essays before the videos does seem the better strategy but some participants would rather have the videos first to spark off ideas. 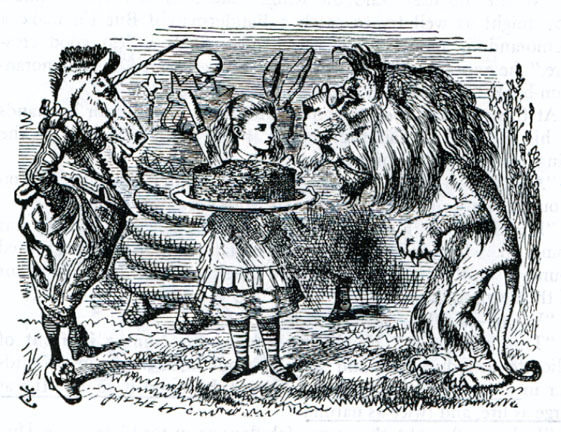 Could anyone reading ‘Alice’, perhaps for the first time, really not have ideas of their own? Perhaps a lack of confidence and a mistaken belief that the only ‘correct’ interpretations are the ones handed down by the Professor is the root cause. The last literary essay I wrote was a very long time ago but I did manage 4/6 on the two essays I submitted for peer assessment. This is not too surprising as the marking scheme is tightly constrained. There are two categories: form (grammar, usage, and structure) and content (matters of insight, argument, and example). Each is marked on a scale of 1 to 3 so the marks awarded can only range from 2 to 6 and unless the form or content perceived by a reviewer is undeniably awful or absolutely brilliant, the most likely score is 4. Most participants make 4 but not all are happy and there’s the usual controversy, beloved of xMOOCs, about given grades and the marking scheme. The marking scheme is probably designed to keep up grade averages and limit excessively low or high scores. It’s certainly crude and of course it’s operated, with or without due diligence, by other participants. Perhaps a participant’s averaged grades will make some sense by the end of the course but peer assessment is the only means of assessment. My feeling is that these grades have considerably less significance than many participants are led to believe. The feedback on my own essays was brief but friendly and quite helpful. Many participants (like me) are unpractised literary essayists so some inconsistency between 4 peer assessments on the same essay is to be expected. One peer comment really made me think, “Be careful of words like would, may, appear etc. You are convincing me of your point, use more aggressive language.” But my literary interpretations can be quite speculative and so too are many other interpretations I’ve come across on this course – sometimes wildly speculative! Dressing up speculation with unduly assertive or aggressive language seems a bit like getting a debating point across by shouting. This course is a new experience for me. I enjoyed the reading and writing but found it all very time-consuming and now with several other projects on the go I’m only monitoring progress. I hardly participated at all in the forums but there was good discussion and debate there. This was clearly the focal point of the course for a small minority of participants and participatory learning and engagement was certainly in evidence. Participants were urged to use the forums but in spite of the usual section for “General discussion about the course, life and everything under the sun.” attempts to move outside the silo’s unspoken limits were politely discouraged. For example, a few participants (not me!) wanting to publicise their own writing met with dusty responses. Of course it’s not a creative writing class but what do Michigan or Coursera have to fear? – criticism by participants who Know What they Signed Up For? – mass exodus from the Proper Course? – overloaded servers? I doubt if these concerns are significant. Some mild ‘forking’ of the course might even help reduce the dreaded dropout rate! At this moment the Uniconx sauntered past with his hands in his pockets. ‘I ran the best course this time?’ he said to the King. ‘It was for their own good’ the Uniconx said carelessly, and he was going on, when his eye happened to fall upon Alice: he turned round rather instantly, and stood for some time looking at her with an air of the deepest disgust. ‘What — is — this?’ he said at last. ‘It can talk but it can’t think for itself,’ said Haigha, solemnly. ‘Yes, if you like,’ said Alice. Haigha took the large connected cake out of the bag and gave it to Alice to hold while he got out a dish and carving-knife. ‘It’s my visible Customer!’ the Uniconx cried out proudly before Alice could reply. The King was evidently very uncomfortable at having to sit down between the two massive creatures; but there was no other place for him. ‘What a time the Customer is, cutting up that cake!’ he sighed. This sounded nonsense, but Alice very obediently got up, and carried the dish round and the cake divided itself into three pieces as she did so. ‘Now try to cut it up,’ said the Lionc, as she returned to her place with the empty dish. ‘She’s only trying to share but she’s kept hardly any for herself’ said the Lionc. ‘Don’t you like connected cake? Several pieces of the cake fell to the ground and found their way into the brook. ‘Of course I can think for myself!’ cried Alice indignantly. ‘Then choose to run the course with me’ said the Lionc triumphantly and offered her a paw. ‘This way, that way or the other?’ asked the Lionc pointing down the same path but he bounded off before Alice could answer. ‘Rather like the Bell-Ringers Daughter – ha! ha!”, exclaimed the King as he wandered off. Hi G! Let me on your blog! @MOOCow Sure come right on! – good to see you again! Gordon: So what have you been up to MOOCow? Can’t talk for long – doing serious coding in Python. MOOCow: Hi G, I’ve been privately interviewing people about MOOCs – I need your frank and honest opinions. G: Well OK, I’ll be frank as long as it really is private. MC: Trust me G – cross two hearts and hope to die! I’ve done interviewing active MOOC participants and now I want your thoughts as a Veteran Lurker. G: Woah MOOCow! – we don’t use the ‘L’ word now – I’m a Sampler! MC: Oh yeah? Downloading videos from every xMOOC going and never looking at them? Following cMOOCs as if they were soap operas and now you can’t stop playing with your Python! G: That’s not very nice! Downloading new stuff always takes longer than learning the old. As for soap operas, cMOOC discussions can make for good rollicking stories – heroes, antiheroes and the odd cliff-hanger! I’m a serial monotasker. I’d rather do something than talk or blog about it and while Python programming may be too geeky for you I’m proud of my new Comment Collector and pleased to describe it to you in great……. MC: That won’t be necessary G. Let’s have your current thoughts about MOOCs instead. G: Well OK then – I enjoyed Rhizomatic Learning (rhizo14) though I never really understood the theory. Reminded me of when I was in CCK11 (NOT as a Sampler) – couldn’t get my head round Connectivism either but great fun all the same. When you’re in a theoretical MOOC – Connectivism, Rhizomatics, Marxism, whatever – just go along with the crowd then, quick as a flash, change your spots before the next one! MC: Nonsense! You never understand anything properly because you’re too lazy to read stuff and then you’re too scared to ask for help! Get over it or stay stupid – good learners make their own learning. You humans are like sheep – one of you (usually male) says “BAAA!” and you all go “BAAAAAAA!” and follow him, 3 bags full, until someone else comes along with another theory. Use your meager intelligence to learn what’s actually useful for YOU – and then MOOC on! G: Hey! – that’s unfair. Look at the Connected Courses MOOC (ccourses) – not much theory there and plenty educators actually trying things out with real students. All the same, I just wonder how much was learned. I tell you, they were drawing cartoons, posting photos, doing these Zeega things – even writing poetry!! MC: But even you tweeted a ‘where you sit’ photo for ccourses and not so very long ago you even munged a silly poem about cats into a silly poem about MOOCs! G: OK! OK! – I got over-excited and carried away. Sure, some of the ccourses Zeegas were really good, learning about new tools and so on but there was off-topic stuff, personal revelations and what’s more…. MC: Off-topic, my hoof! – I thought you’d got it into your head at last that a cMOOC isn’t a trad course at all – it really IS Something Else. Education really is life – the more excitement that can be pushed online the better chance you humans have of learning something – anything! 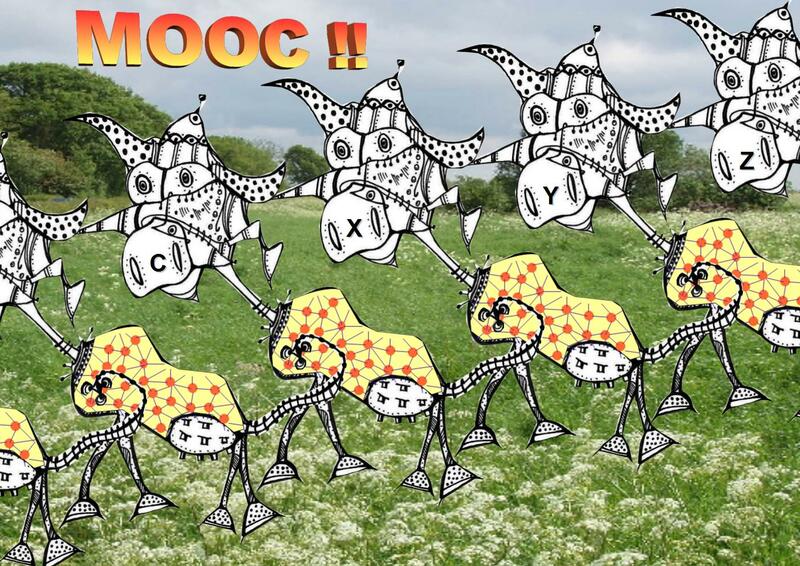 Play games, post silly drawings, sing and shout, write poetry, confess your sins – doesn’t matter what you do as long as you make waves and connect and that’s how MOOCs progress – the march of the MOOCs! Great waste of time though. We cows have a saying, ‘The best way to cross a field is to cross it!’ – we don’t get over-excited before we ruminate. G: Eh? That’s all very well but some of us don’t like games and of course you can never be too open. I keep photos of myself off the public web – might get hounded by lonely women if my image gets stolen and used by scam dating websites. MC: Um .. little danger for you there G. Look, in some very important ways the web is NOT like real life. Let me elucidate in 4 easy Lessons all you need to know about the web. There’s room enough on the web for all you humans to do whatever YOU want, setting your own targets and boundaries. It’s far easier on the web to avoid being drawn into something you don’t want than it is in real life – eg futile face-to-face arguments. And you don’t HAVE to work yourself into a frenzy reading those appalling comments on YouTube – one click and you’re off somewhere else. Unlike real life there’s always somewhere else to go or any number of ways to make your own space. Assume everything you do is recorded and stached away in a cloud for ever by somebody somewhere – it probably is! Don’t do anything you don’t want your friends / employers / kids / grandkids / great grandkids / great great … (you get the idea) to know about. Nothing is forgotten. The web is for ever. Too many people have NOT learned Lessons 1 and 2. You’re not born with a domain of your own or a Rheingold Crap Detector inside you – so see to it! The web’s becoming much more complicated, mixing and mashing with real life. Heard of the ‘web of things’? It’s not just about fancy wristwatches or talking to your fridge. Educate your kids about the web – and your ignorant old goats too! MC: You humans love to make up your minds about stuff or, better still, have it made up for you – jumping to conclusions faster than a cow on a cactus! What’s that? – oh sorry G, I was on my cPad. Of course they’re not ignorant but they’re just a tiny elite – future leaders perhaps, who knows? I only hope they know enough to get off their hindquarters and do useful stuff in the real world. Leadership IS important and some MOOC participants are great communicators but they’re not necessarily good at anything else. Rheingold, Cormier (and his boss) and a few others are probably harmless enough and maybe worth following if that’s your thing but as for that Levine…. MC: He’s a COW HATER and should be prosecuted! “… COWS, THEY LOOK SILLY. AND FART A LOT.” – it’s all down here on his stupid dogcog blog!! He’s barking mad!! I’ve never been so insulted since I thought Siemens called me a Nonsensemaking Artifact. @Gordon_L She’s in my slidedeck today! A true beauty. MC: Oh!! Well – that does have the ring of truth. OK, he’s probably got over his existential angst but he should get out more, take up a hobby – photography or something. Hey! – there goes my cPad again! Have to get over fast to Heathrow to join George for the next flight to Kyzyl for another keynote on something or other – hope no crying babies! Well thanks for letting me interview you G. I’ve said lots of good stuff here and I really think all this should be published. G: No way, this is a serious blog. People might be offended and you promised it would stay private. By the way, what was Lesson 4? MC: Lesson 4 – The Untrusting Web. Be careful who you trust on the web – very important. G: Nobody knows you’re a cow on the web – Ha! Ha! MC: And I’m using my superpowers to lock this interview down, publish it and send out a tweet in your name! G: MOOCow! NO!! – I trusted you! – WAIT! 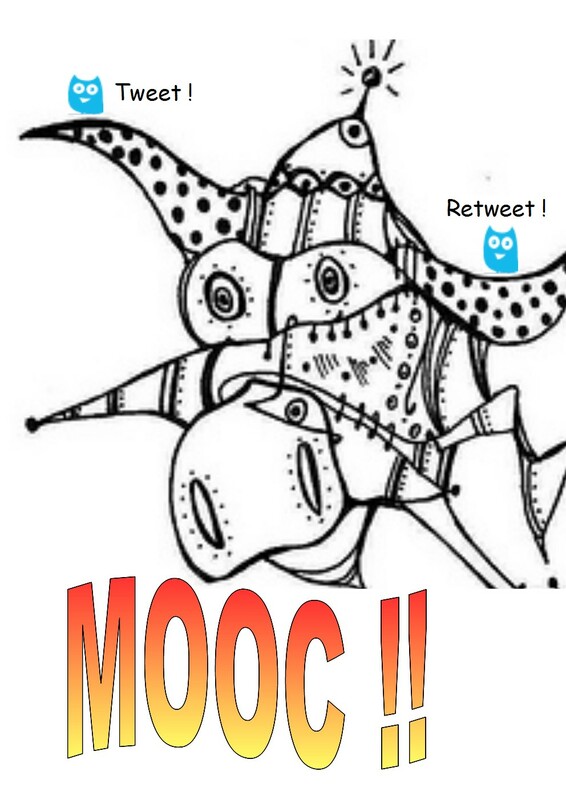 ‘March of the MOOCs’ Private thoughts of Veteran Lurker revealed by humble MOOCow! The one draw back to networked learning is that while we have managed to advance conversation on the fragmentation of learning so that it is not a cohesive whole created solely by the instructor, we have not yet advanced the process of centring or stitching together fragmented parts into cohesive wholes for individuals. This has certainly been my experience of networked learning and is particularly true of the mammoth xMOOCs where huge clunky forums can be so overwhelming that a majority of participants just keep away. 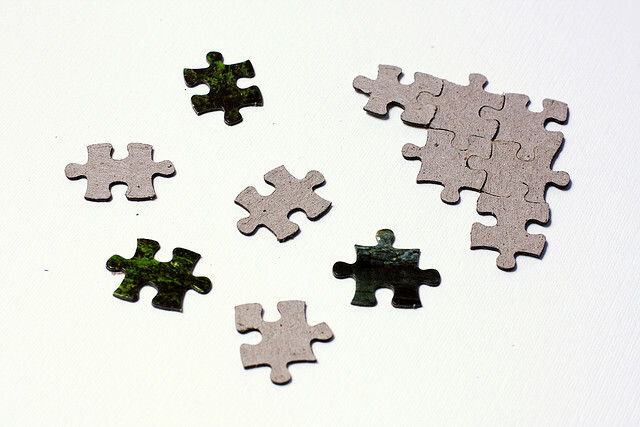 In connectivist MOOCs, participants are encouraged to use their own blogs and social media for interaction but there’s still a need for ‘defragmentation’ – a means of signposting MOOC activity in one place in ways that are meaningful to the individual. There are of course RSS readers but these focus on the aggregation of blog posts rather than active discussion and interaction between participants. MOOCs sometimes pull together participant blog postings into a single ‘blog hub’ but the resulting presence of duplicate posts can be confusing, particularly if discussion about the same post is fragmented with comments appearing on the hub independently of other comments on the original post. Interaction between the participants of a MOOC can centre around social media such as Google Plus, Facebook or even Twitter and a dedicated Facebook Group page can be very effective in tracking current activity. In this case, the most recently active threads appear first, often with relevant images and the non-active ones gradually fall into obscurity. This can result in timely and fast-moving forum discussions although the various threads are unlikely to carry the more substantive contributions typical of blog posts. Over-dependence on social media is not without a price. Participants who are not registered for some services will be excluded and there is the inevitable manipulation of users and their data for commercial purposes. Setting aside the practical problems of implementation, what considerations should apply to the design of a ‘MOOC defragmenter’? Give primacy to personal web space – First and foremost participant web spaces should be recognised and scanned as the major source of data. Currently, most participants are unlikely to have their own web spaces but setting up a personal blog has never been more straightforward. The trend towards establishing a digital presence on the open web is set to continue as the benefits of controlling one’s own data and digital identity become more widely recognised. Innovation such as ‘Domain of my Own‘ demonstrates that owning and managing one’s own slice of the web is not just for the geeks. 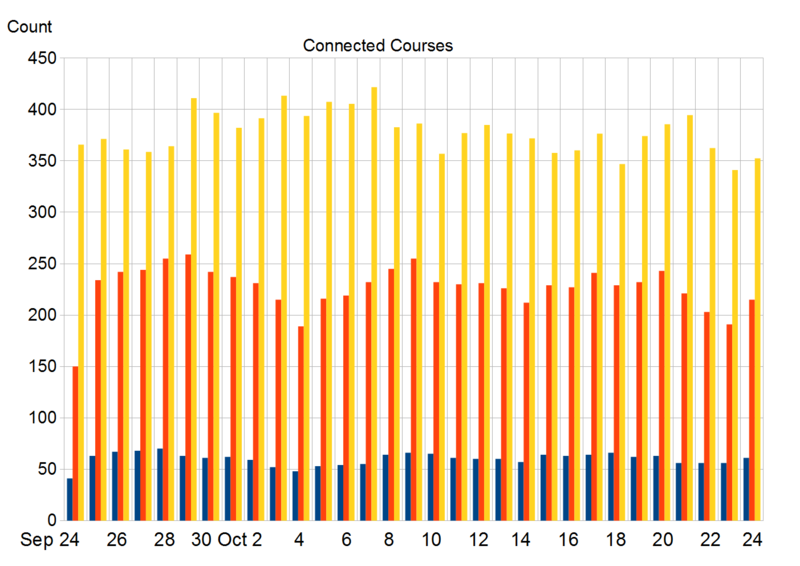 Signpost current activity – Create a concise overall view of current MOOC activity on a single page. Focus on the wood rather than the trees. Activity could be signposted by direct links to participant spaces with older material dropping down in classic Facebook style. Little manipulation of content or additional material is envisaged so that participants are encouraged to move on to whatever fragment of the MOOC they find of particular interest. Openness Rules! – Clear information about rules, settings and any other uses made of participant data should be freely stated and available. Selecting output from a miscellany of inputs necessarily involves a set of rules that are designed to bring together and output MOOC fragments as a cohesive whole. Rules, however, can be manipulated, commercial advertising being the obvious example. Data could also be collected for academic research or other purposes. MOOCs are complex systems and the rules governing effective defragmention are also likely to be complex. Some rules may be misunderstood, unacceptable or even detrimental to the interests of some participants. Returning to the practical, I have experimented with a ‘MOOC Comment Scraper‘ that generates brief summaries of WordPress and Blogger comments and posts by scanning the RSS feeds of participant blogs. The latest version was well tested during the excellent Rhizo14 MOOC and considered to be a useful facility by many participants (see MOOC Comment Scraper Output – #rhizo14 ). Further development has now resulted in a ‘Comment Collector’ where output items are ordered according to the date of a post’s latest comment rather than the date of the post itself. An example output was derived from a real MOOC (nonsense text replaces real). The presentation could be enhanced in a number of ways but as an amateur programmer I’m unlikely to produce a really comprehensive MOOC defragmenter! All the same, I’d be pleased to find another MOOC for a field test.